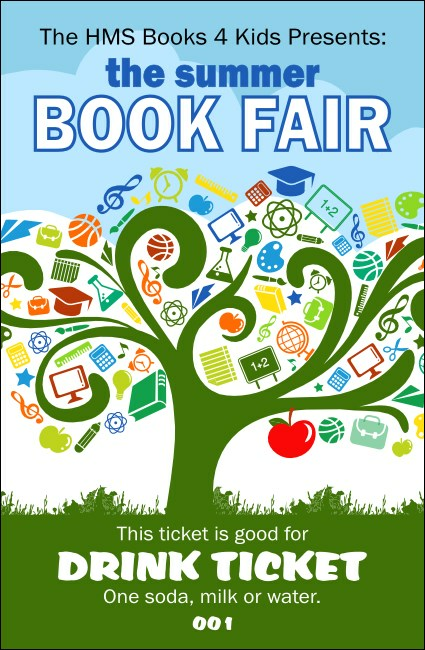 Put a smile on every bookworm’s face when you give them School Tree Drink Tickets at your next book fair. These colorful ticket templates feature the whimsical image of a giant tree blossoming with reminders of your favorite school subjects, like Erlenmeyer flasks, musical notes, chalkboards, and alarm clocks, with lush green grass underneath. Find the right ticket to encourage summer learning at TicketPrinting.com.